How to Promote Political campaign with Bulk SMS Marketing? As the communication mediums and technologies are evolving through the years, one of the key components of our democracy that has to keep up with the pace of time is the political campaigning. From the personal handshakes to connecting via emails- a political campaign includes them all. Political parties are using the bulk SMS services which is the most efficient and effective medium of two way communication. SMSLAB helps you to promote political campaign with Bulk SMS Marketing. Why bulk SMS marketing is important for Political Campaigns? Bulk SMS marketing involves the use of SMS texts to communicate with your voter base. Bulk SMS can also be used by the political parties to maintain communication between the campaign staff and volunteers. Campaigns need to give an option to sign up in order to start receiving the messages. Bulk SMS marketing can be used to collect the information of the user. Political parties can use shortcodes for rallies and campaign literature. For example Text VOTE to 252525. People opt for receiving the campaigns text messages through the duration of the campaign. But if you are asking the people to opt-in and leave the conversation for later, you are missing out valuable voter information that you can collect from the voter. The opt-ins can get the phone numbers as well as the ability to keep the person in the loop about the campaign activities. These numbers are used in the future for follow-up campaigns. Instead of keeping the voter data collection for the later use, political campaigns can help you to gather voter data as soon as possible. The best use of bulk SMS service is to send the campaign updates to the supporters, staff, and volunteers. It is used to convey the candidate’s take on the relevant issues, send notifications to the voters about the media appearances and make fundraising appeals and the campaign announcements. Unlike conventional text messaging, modern platforms allow you to send messages to a huge audience in just a few seconds. Each message can be personalized with the name of the user and messages can also be scheduled for sending at the right time and date. Imagine if you have to send thousands of messages manually. This can be a very daunting task. Bulk SMS service is the best way to send customized and automated messages. Political parties need to understand the behavior of the voters. This is a great way to design a political campaign. Once you are done with the subscriber list, you can send bulk SMS to the entire list of contacts or to the segmented contacts based on the location, job title or any other matrices. Send the poll to the voters through bulk SMS marketing. You can also set up an automatic response when people reply back based on the keywords. You can send the message marketing to send out the event updates and identify the identities. The best method is to send a notification to your voter lists with an event update. For example, “Hello, there will be a party rally event this Friday on 6th July at 2 pm. Will you be able to join us? Reply “Y” or “N”. The software can easily segment the user based on the response. The alternate method is to use CRM software. With the text message software and CRM integration, you can create an event in your CRM software and run the RSVP campaign by using the bulk message software. The response can be easily synced to the CRM so that the persons sending “Y” are automatically sent the follow-up updates about the event. Volunteer organizing works similar to event management. Here, you are inviting the supporters to volunteer for your event rather than a generic appeal for the attendees. Send an event invite via text message and based on how subscribers RSVP to your invitation. You can also try the drip SMS messaging for affirmative users. Drip campaigns are used when the event volunteers are sent the instructions via email and SMS asking for the confirmation that the message has been read. When the volunteer responds, the software organizes the keyword and moves on to the next stage of the drip campaign. Bulk SMS marketing can be used to send reminders to the citizens to go and cast their vote on the election day. This is important because a voter outreach campaign can fail if the people don’t turn out on the voting day. Send reminders to people giving information about the voting venue, date and time. Keep in mind not to flood your subscriber’s inbox through fundraising appeals or high frequency messaging. SMSLAB is the best choice if you are looking to carry out the political campaign with bulk SMS marketing. Contact SMSLAB.in for all types of bulk SMS services. SMSLAB is the best bulk SMS service provider in Chandigarh that offers both the promotional and transactional bulk SMS services and provides the best return on investment. SMSLAB is India’s trusted and online Bulk SMS messaging services in India. Moreover, We are trusted by various educational institutes, enterprises, hospitals, e-commerce businesses, finance organizations clients due to rich-feature solutions, no-delay messaging and low price SMS Services. 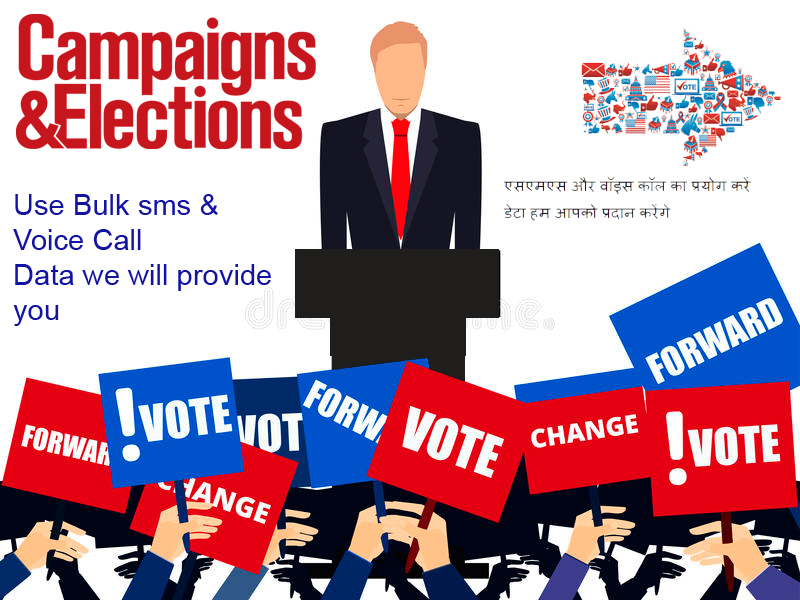 How Can Bulk SMS Service Help You to Promote Your Election Campaign? How Bulk SMS are Beneficial for Election Campaigns in Gurgaon?